Measurements of surface loss throughout the visible and in the near-infrared on a single crystal diamond using laser calorimetry reveal that it is governed by Rayleigh scattering. This was confirmed by Atomic Force Microscopy that revealed surface roughness much smaller than the wavelengths used. There is no detectable contribution from surface absorption on this material as finished and cleaned. Measuring the dispersion of surface loss offers a powerful tool in determining its cause. A. T. Collins, “Intrinsic and extrinsic absorption and luminescence in diamond,” Physica B 185(1–4), 284–296 (1993). I. Friel, “Optical Quality Diamond Grown by Chemical Vapor Deposition,” in Optical Engineering of Diamond, R.P. Mildren, and J.R. Rabeau, eds. (Wiley-VCH, 2013). J.-M. Mäki, F. Tuomisto, C. Kelly, D. Fisher, and P. Martineau, “Effects of thermal treatment on optically active vacancy defects in CVD diamonds,” Physica B 401–402, 613–616 (2007). R. Jones, L. S. Hounsome, N. Fujita, S. Öberg, and P. R. Briddon, “Electrical and optical properties of multivacancy centres in diamond,” Phys. Status Solidi 204(9), 3059–3064 (2007). P. M. Martineau, S. C. Lawson, A. J. Taylor, S. J. Quinn, D. J. F. Evans, and M. J. Crowder, “Identification of synthetic diamond grown using chemical vapor deposition (CVD),” Gems Gemol. 40(1), 2–25 (2004). R. U. A. Khan, P. M. Martineau, B. L. Cann, M. E. Newton, and D. J. Twitchen, “Charge transfer effects, thermo and photochromism in single crystal CVD synthetic diamond,” J. Phys. Condens. Matter 21(36), 364214 (2009). S. Webster, Y. Chen, G. Turri, A. Bennett, B. Wickham, and M. Bass, “Intrinsic and extrinsic absorption of chemical vapor deposition single-crystal diamond from the middle ultraviolet to the far infrared,” J. Opt. Soc. Am. B 32(3), 479–484 (2015). A. Tallaire, A. T. Collins, D. Charles, J. Achard, R. Sussmann, A. Gicquel, M. E. Newton, A. M. Edmonds, and R. J. Cruddace, “Characterisation of high-quality thick single-crystal diamond grown by CVD with a low nitrogen addition,” Diamond Related Materials 15(10), 1700–1707 (2006). R. S. Balmer, J. R. Brandon, S. L. Clewes, H. K. Dhillon, J. M. Dodson, I. Friel, P. N. Inglis, T. D. Madgwick, M. L. Markham, T. P. Mollart, N. Perkins, G. A. Scarsbrook, D. J. Twitchen, A. J. Whitehead, J. J. Wilman, and S. M. Woollard, “Chemical vapour deposition synthetic diamond: materials, technology and applications,” J. Phys. Condens. Matter 21(36), 364221 (2009). I. Friel, S. L. Geoghegan, D. J. Twitchen, and G. A. Scarsbrook, “Development of high quality single crystal diamond for novel laser applications,” Proc. SPIE 7838, 783819 (2010). E. M. Wilks and J. Wilks, “The resistance of diamond to abrasion,” J. Phys. D Appl. Phys. 5(10), 1902–1919 (1972). G. Turri, Y. Chen, M. Bass, D. Orchard, J. E. Butler, S. Magana, T. Feygelson, D. Thiel, K. Fourspring, J. Pentony, S. Hawkins, M. Baronowski, R. V. Dewees, M. D. Seltzer, A. Guenthner, D. C. Harris, and C. Martin Stickley, “Optical properties of epitaxial single-crystal chemical-vapor-deposited diamond,” Proc. SPIE 6545, 654504 (2007). 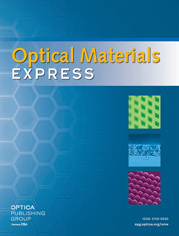 D. C. Harris, L. F. Johnson, R. Seaver, T. Lewis, G. Turri, M. Bass, D. E. Zelmon, and N. D. Haynes, “Optical and thermal properties of spinel with revised (increased) absorption at 4 to 5 μm wavelengths and comparison with sapphire,” Opt. Eng. 52(8), 087113 (2013). Fig. 1 Atomic Force Microscope topography of a single crystal diamond sample displaying a contour plot covering a 5 × 5 µm scan range. Ra from the two largest surfaces was determined to be 0.17 and 0.18 nm. Fig. 2 The absorptance versus path length in the single crystal diamond (408 nm; purple squares, 446 nm; blue circles, 532 nm; green triangles, and 1064 nm; black diamonds). The data has been fit with a linear regression using Eq. (1) and the results of this equation are tabulated in Table 1. The y-intercept is the surface loss and the slope is the absorption coefficient in cm−1. Fig. 3 (a) Surface loss (αsurf) from Eq. (1) versus wavelength and fit with a Rayleigh function regression. (b) Surface loss versus wavelength plotted as a function of Rayleigh scattering (λ−4) and fit with a linear regression. Data points are plotted with the following scheme: 408 nm; purple squares, 446 nm; blue circles, 532 nm; green triangles, and 1064 nm; black diamonds. Table 1 Data which has been fit with a linear regression using Eq. (1). Graphical results for the dispersion of surface loss are plotted in Figs. 2 and 3. Data which has been fit with a linear regression using Eq. (1). Graphical results for the dispersion of surface loss are plotted in Figs. 2 and 3.